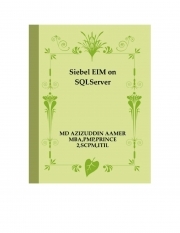 Description of "Siebel EIM on SQLServer (eBook)"
This book covers Siebel EIM and Data Loading Best Practices on Microsoft SQL Server Database. It also discusses the Various tools available on Microsoft SQL Server and how to use in order to Improve Siebel EIM Performance. Reviews of "Siebel EIM on SQLServer (eBook)"